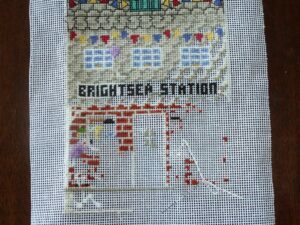 Only this much space to fill now and I’ve nearly finished stitching the roof. When I’m designing these I always worry about the roof. If I don’t put anything up there it’s going to be boring to stitch but how many things can you put on a roof? This time I’m going with bunting, balloons and skylights. To all my readers and customers: however you celebrate this time of year I wish you all peace, joy and laughter. Be safe out there. This entry was posted in Uncategorized on December 22, 2013 by Elli Jenks.